If you sometimes feel as though you were the only person in the whole group whom the mosquitoes are feeding on you, then we would highly recommend getting the Cordless Backyard Mosquito Mister. This cordless mister comes without any wires for a very obvious reason – so that you can roll it anywhere within a yard, creating a 2,000′ square area of “silence” for mosquitoes, thanks to the use of EPA-registered permethrin – a synthetic form of naturally occurring pyrethrin derived from chrysanthemum which is able to kill up to 90% of mosquitoes, flies, gnats, ticks, and other biting insects. We’re quite surprised to hear that a three-minute misting is able to last for up to half a dozen hours, that’s a superb return for your investment. Not only that, permethrin biodegrades quickly so that it won’t harm the environment in any way. 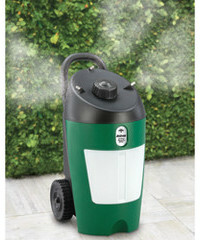 The mister itself comes with a rustproof, two-gallon polypropylene tank which will accept a bottle of permethrin that is mixed with water from a garden hose, while a trio of nozzles generate a fine mist. The asking price? The Cordless Backyard Mosquito Mister will cost you $299.95.